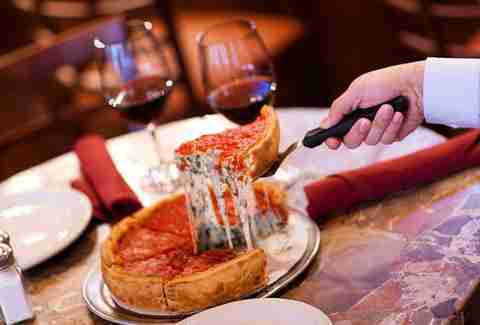 Chicago critics tend to dismiss Chicago deep dish as overblown, casserole-like, and a monstrosity next to New York thin crust. In fact, no one likes deep dish... except a certain set of locals and every tourist who comes here, makes a beeline for Pizzeria Uno or Gino's or Giordano's, and staggers out two hours later as happy as a zombie on the Thanksgiving episode of The Walking Dead. We surveyed the city far and wide to come up with our own list of the very best, leaving off some famous names and including some you've probably never heard of. 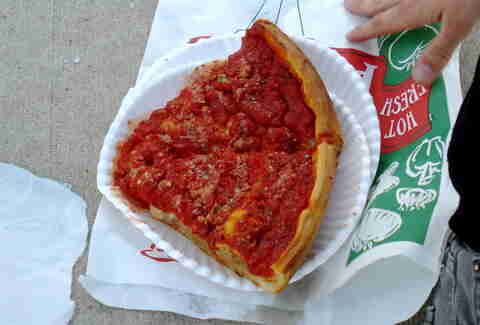 Happy gorging, Chicago-style. Uno is where the original deep-dish style -- a crispy short dough crust, topped with cheese first, then crushed tomatoes -- was invented in 1943, which later expanded to its sister restaurant Pizzeria Due, a whole block away, when it caught on. We salute it as living history, though we think there are places doing the original style better today. This is one heavy pizza, thanks to the pastry-like crust, and especially if you get sausage on it... which literally means a solid disk of sausage plopped on the crust like a hubcap on a tire. Despite the long waits, it's a Chicago institution, and we maintain you have to try it at least once. Even thicker than the original deep-dish style, stuffed pizza dates back to the 1960s and is built sort of like pizza pot pie, with a second crust on top covered with tomato sauce. Usually the crust is more bread-like and flaky than the traditional style. 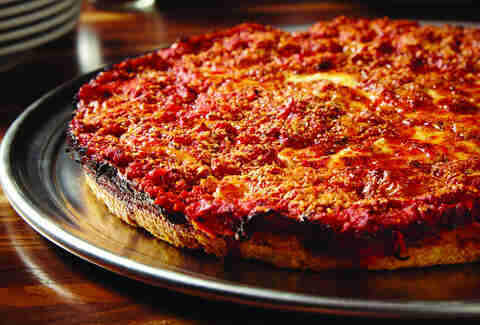 Tano's revives the family recipe from Manzo's, an old-school Italian joint in the same neighborhood, and the stuffed pizza has a good crust and a tasty (if a bit too cloying for some) tomato sauce. Rudy Malnati Sr. is one of the people credited with inventing deep dish at Pizzeria Uno, and his son Rudy Jr. launched this local chain. Unfortunately, Mama Malnati had already given the family pizza crust recipe to brother Lou for his own chain (see below), so she devised a new one for Rudy. 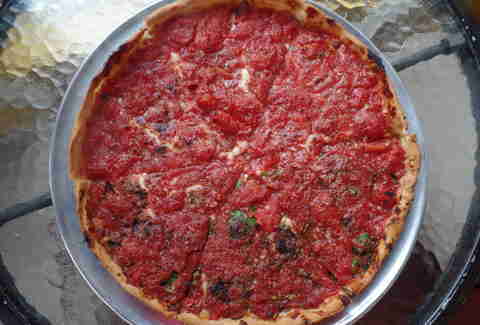 That's why we give the nod to Lou for classic deep dish (Rudy wins at thin crust). But this is still plenty good, with a similar crispy-crunchy hard shell setting up a sturdy base for robust tomato and cheese. The old-timers claim that deep dish is North Side pizza and real Chicagoans -- by which they mean South Siders -- eat tavern-cut thin crust. There's some truth to that (though Giordano's started on 63rd St, to name one example), but these days deep dish is all over the South suburbs. Few are more dramatic than the deep dish served at this place in suburban Alsip, with a ring of flaky crust as tall as a medieval wall barricading a thick lake of gooey cheese and tomato. Bartoli's claims descent from a classic (the family opened Gino's East but sold it long ago), and the deep dish here is well-balanced with a nice flaky crust that doesn't sit like a gut bomb. The sauce is a little sweet, as old-school ones often are in Chicago, but it works well both with something neutral like spinach and a topping that adds a little kick, like pepperoni. It's also got slices to go, if you don't think you can pound down an entire pie yourself. Louisa DeGenero was a cook at Pizzeria Due when she decided to open her own place in the South suburbs with her daughter in 1981. (It's just down Highway 50 from Nino's in Alsip, in fact.) This is a contender for the best original-style Chicago pizza currently being made, with a lighter, puffier butter crust, yet that same robust sauce studded with chunks of tomatoes and fennel-rich Italian sausage you've come to expect from a classic local deep dish. 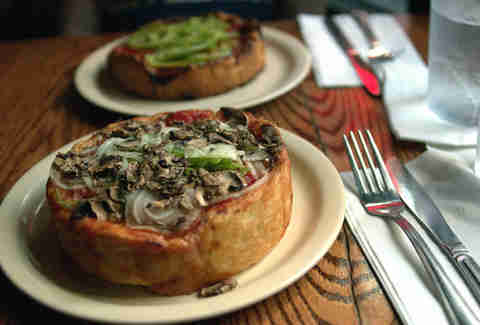 The third main style of Chicago deep dish is pan pizza, where the ingredients sit on top of a puffy crust. 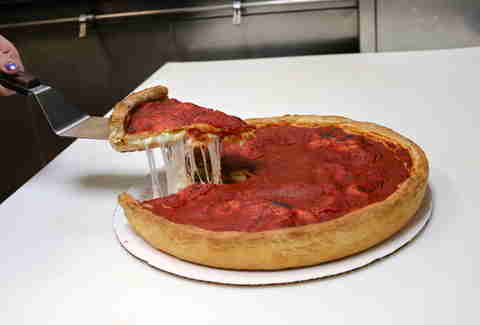 What sets Chicago's pan pizza apart from similar styles across the country is the crispy edge of caramelized cheese turned lacy and almost black -- the invention of Burt Katz, who launched and sold several pizzerias from the 1960s on, including this one. From the cheese that's sharp enough to cut your gums to the acidic blast of the tomato sauce, this is put-hair-on-your-chest pizza, one to work up to only after you've proven you can take on milder versions. Lines snake out the door here on weekends, so if you're not up for risking an hours-long wait, visit another day. Whether or not he invented it, Lou's dad Rudy was present at the creation of what is probably the pizza that comes closest to what original deep dish tasted like. And this is a deep dish that extols the virtues of simplicity: buttery crust, a thick layer of cheese, bright canned tomatoes, and Italian sausage with a hint of wine. 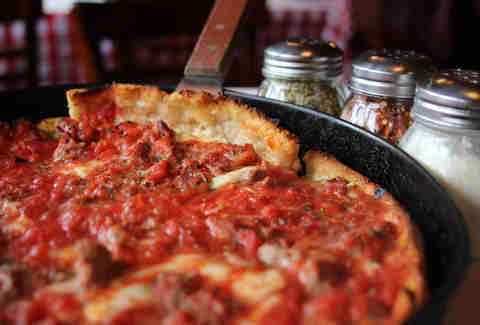 A Tribune poll some years ago named this the best deep dish in town, and as far as stuffed goes, we won't argue. It just gets everything right, from the flaky crust to the brightly spiced tomato sauce on top. For Lakeview, at least, it revived a style that had gotten kind of chain-boring. The pizza is big and robust enough on its own that we wouldn't even mess with meat. Cheese or spinach is fine (and the sausage is a little weird, anyway). While it seems oxymoronic to dub pizza as "heart-healthy," Bella Bacinos' famous spinach supreme pizza has been called just that. It's loaded with green leaves, a special blend of cheese, myriad herbs and spices, mushrooms (which are optional, though suggested), and a more spicy than sweet tomato sauce. For those less concerned about their cholesterol levels, there's also a large selection of heavier, more traditional pies that come stuffed with Canadian bacon, Italian sausage, or meatballs. 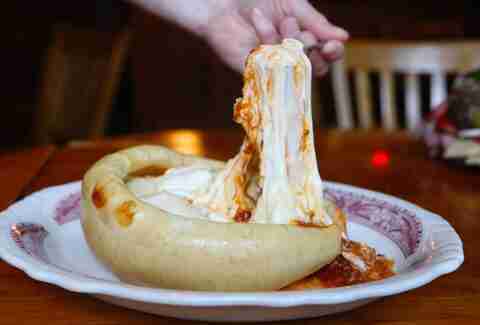 This cash-only joint took the concept of deep dish and revolutionized it with the creation of its pizza pot pies. They're made bottom-up in a ramekin, which first gets loaded with layers of sliced cheese, button mushrooms, and a sauce steeped with homemade pork sausage, and then topped off with a triple-raised Sicilian crust. It's baked, then brought over to the table and flipped over right in front of you. All the fillings settle into the crust, creating a gloriously lava-like meal. Nancy's claims to have invented stuffed pizza. Instead of simply imitating pan pizza, founders Nancy and Rocco Palese created their own pie based on a family recipe for scarciedda, an Easter cake traditional in parts of Italy, and thus their version of American stuffed pizza was born. The signature version features two layers of crust, with cheese and toppings stuffed inside and sauce covering the top. The original 12in pie weighs in at an impressive 5lb and stands 2.5in tall, so prepare your stomach, and your soul, before arrival. 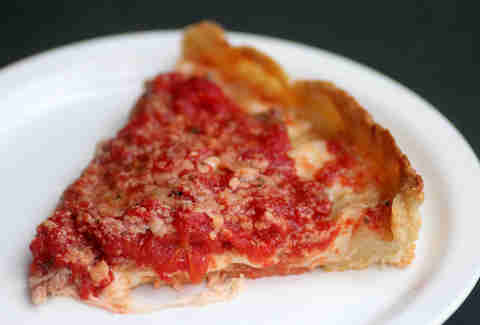 Deep dish at My Pi is truly all-American, with ingredients that are said to be superior to Italy's. 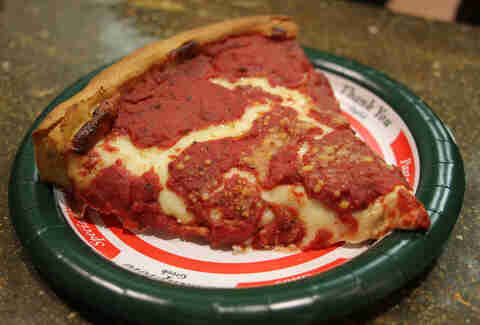 All the cheese comes from Wisconsin, and the San Marzano vine-ripened tomatoes are grown in California. These tomatoes are the reason My Pi is known for its famous chunky sauce -- it's much more sweet than acidic and seasoned with a special blend of herbs and spices. But what makes this pizza really stand out is the crust: It's raised three times and the final proofing happens in the oven, so you're in for a tender, yeasty bite. 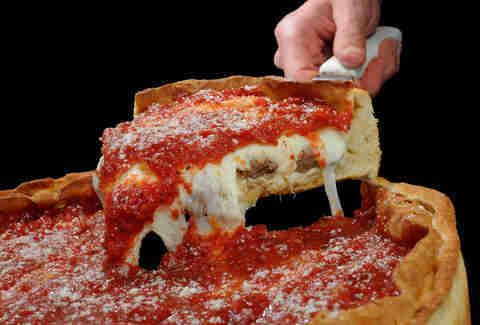 One of the best deep-dish pies is hidden right in the of middle of Chicago. 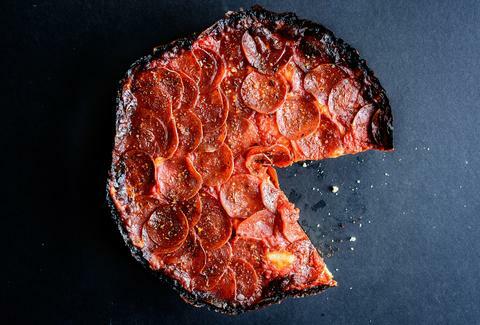 Instead of flaunting a traditional golden-brown crust that soars in height, Labriola's deep-dish pizza is made with a thinner crust that almost resembles the outside of a dark loaf of bread. The sauce is chunky, the mozzarella is sharp, and if you order Danny's Special, its most popular pizza, you'll get a taste of some of the crispiest sausage in town. Amy Schulman is an editorial production assistant who shamelessly eats pizza for breakfast. Follow her on Instagram.